Fill out the form below and you will automatically receive an Email with the offer with unique coupon. An indicates a required field. person and not a spam robot. Privacy - We value our relationship with YOU!. Your Email address is not shared with anyone except KaimukiHawaii.com. 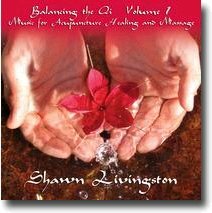 You will be added to the KaimukiHawaii.com monthly newsletter. If you would like to be removed, just reply to the Email confirmation with "DISCONTINUE" in the subject line. Aloha Pops, handcrafted Gelato and Sorbetto on a stick with a splash of Aloha and is proud to give the Kaimuki, Hawaii community a very special offer. 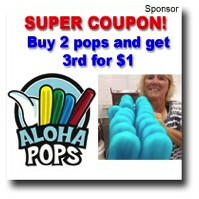 Aloha Pops produces and peddles tasty frozen treats from a custom built tricycle. We help create those special ice cream memories with our nostalgic ice cream tricycle and our very own Aloha Pops. 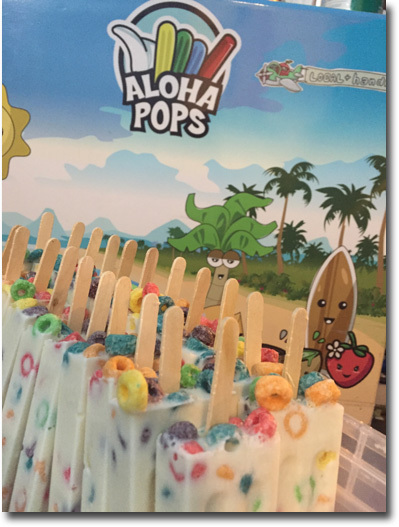 Our Aloha Pops are handcrafted Gelato and Sorbetto on a stick made from locally grown fresh fruits with local flavors and a splash of Aloha. Look for us around the Island of Oahu at Eat The Street, in front of the King Kamehameha Statue on King St. and various other events. We believe in giving back to our community and are available for various fundraising events. Share the Aloha! NEW! - FRUIT LOOP POPS!